For the latest Bold Beasts blog entry, we though we would bring you a heartwarming story of compassion and gratitude. Most of you will already know about the terrible fires that have been raging recently in California. The flames have devastated acres of forest, as well as entire towns full of people. One such town is Paradise, a community which was absolutely devastated by the blaze, to the point where only a few buildings remain intact. Thankfully, most people were evacuated in time. Tragically, others weren’t so lucky. Although the news coming out of California has been devastating, one thing that has really shone through is the human spirit, and the amount of love and compassion that has been shown to those who the fire had left in danger. 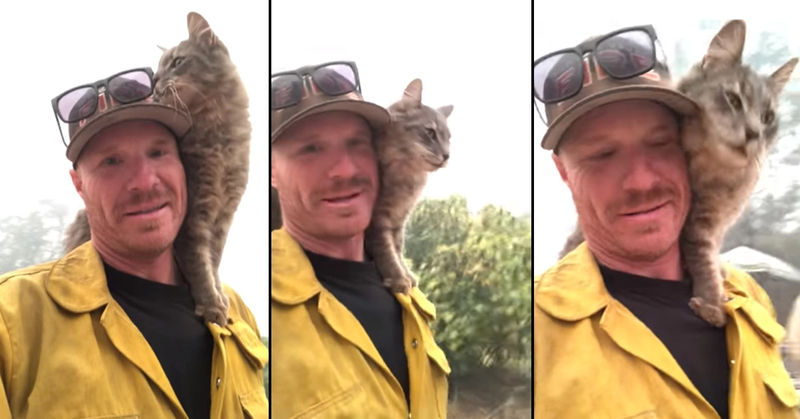 While raking through debris from the devastating Camp Fire that destroyed Paradise, a firefighter by the name of Ryan Coleman came across a fluffy grey cat. Without hesitation, the friendly cat scaled her way up his body and settled down on his shoulders. Anyone who has ever taken care of kittens will know that this is a very common move. The kitty decided that she was already comfortable with her new companion, and rode around on his shoulders and affectionately rubbed her face on his stubble. To me, it is obvious that the cat knew that Ryan had saved her, and was intent on showing her gratitude. Some people day that cats don’t have feelings, or aren’t capable of truly showing love and affection. I challenge anyone to watch this video and still say that! She is clearly head over heels in love with her saviour. Follow Bold Beasts on Facebook for more animal stories like this!